Alaska Foot & Ankle Specialists and Dr. Jennifer Jansma are proud to sponsor Iditarod 2018 musher Alan Eischens and his sled dog team. This year, Alan will be wearing bid number 53 and plans to the finish the “Last Great Race” again with all 16 of his sled dogs. Only 3 other kennels in the history of the Iditarod have finished with the same intact team of dogs, according to Eishens. Alan and his wife Tanjala have owned and operated Double E Kennel in Wasilla, Alaska for 7 years. 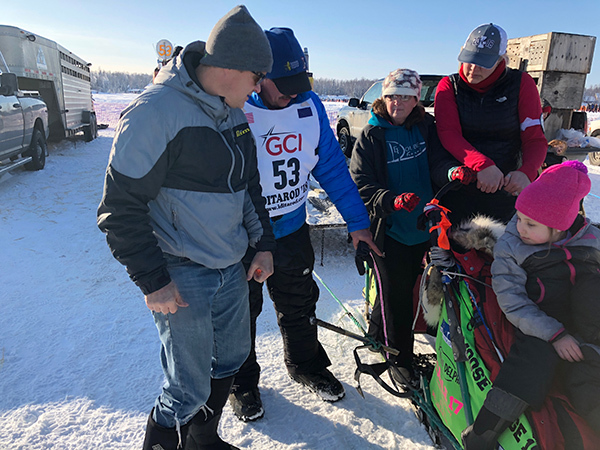 On Sunday, March 4th, AFAS family and friends joined Alan and Tanjala at the Iditarod 2018 restart in Willow, Alaska. It was a gorgeous sunny day, as all 67 Iditarod 2018 teams gathered to begin the long and adventurous journey to Nome, Alaska. All of us at Alaska Foot & Ankle Specialists wish Alan and his team of 16 sled dogs a safe journey to Nome.